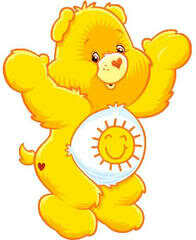 As a child I REALLY liked the Care Bears – my bed donned with Care Bear sheets and playtime filled with the Care Bear count down. 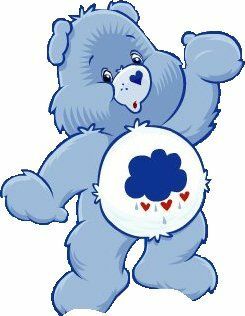 I remember being so envious of some family friends I played with that had plastic Care Bear figurines with a heart shaped cloud carrier. So, when I did a search on Amazon for kids’ costumes and saw that I could get a plush Care Bear costume for my daughter to wear on Halloween, I barely had to give it a second thought! 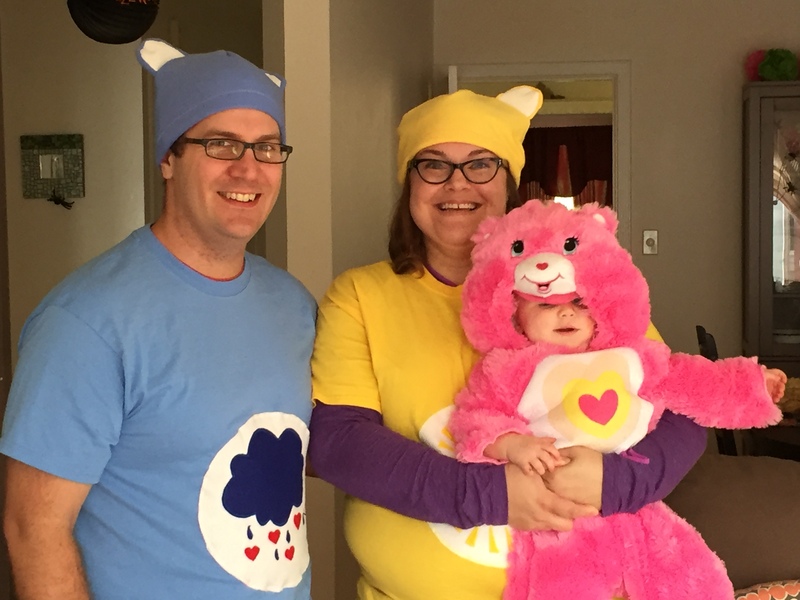 Shortly after receiving the adorable plush costume in the mail for Elise, I realized I needed some coordinating outfits for my husband and I to wear. 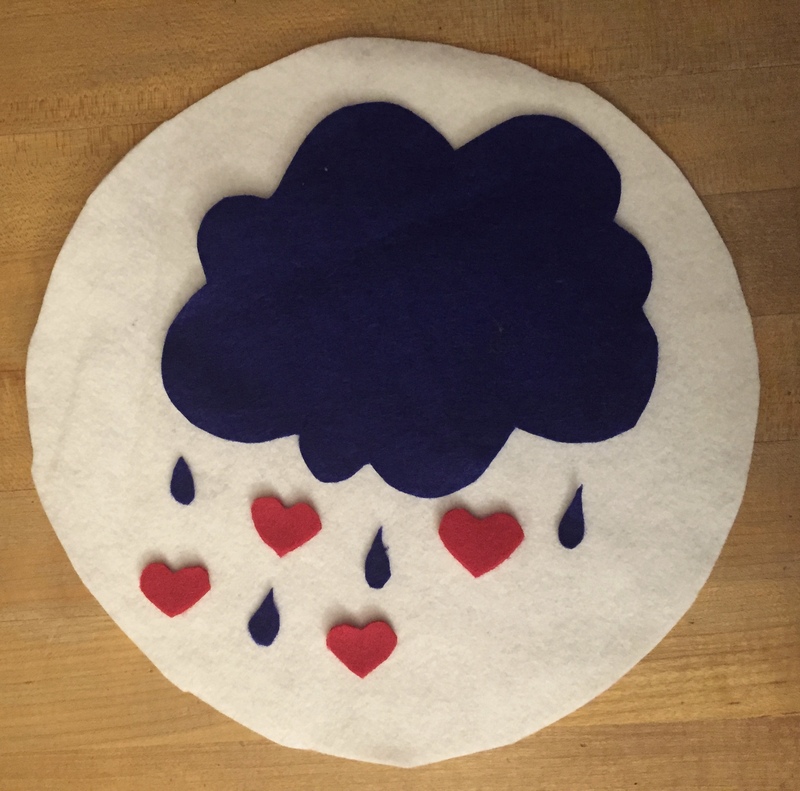 While I certainly could have purchased one of the many Care Bear cosplay outfits available on Amazon, I thought I could definitely make something to save a little money. 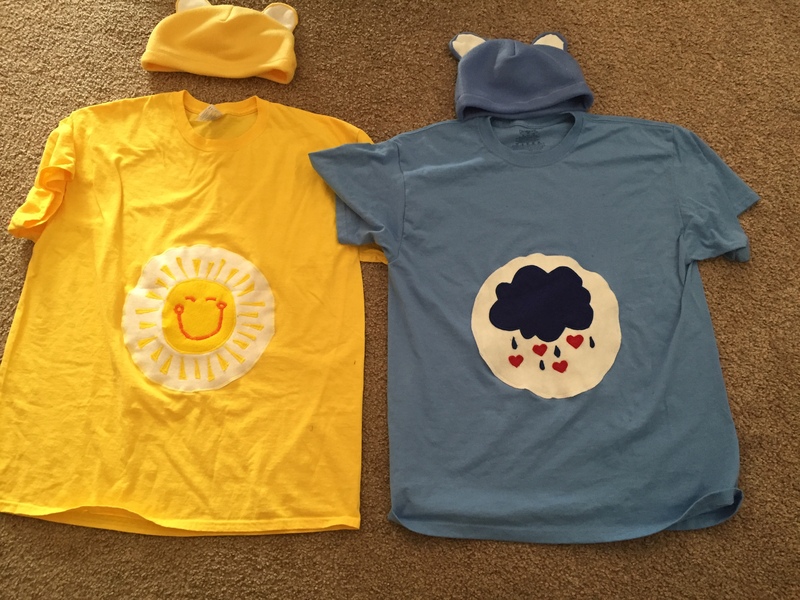 Here is a blog post that provided the basic premise for my costumes and also has GREAT instructions on a sewing-free version using craft glue. 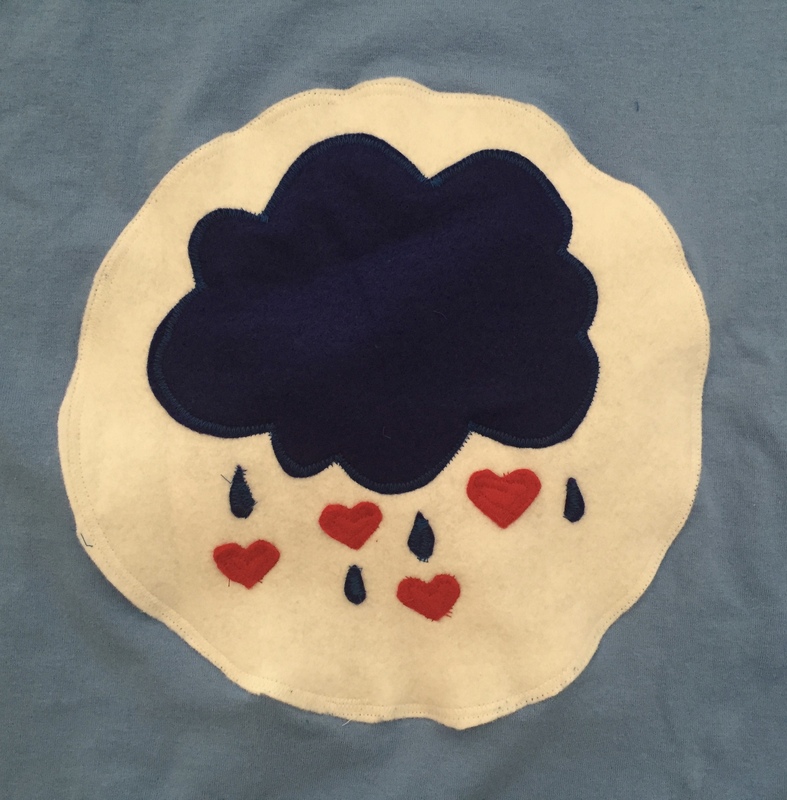 I started with getting a couple of plain t-shirts in colors that I knew correlated to Care Bear characters and some felt to appliqué on “belly badges.” From there, I just copied the designs from pictures of the bears and used a zig zag stitch around the felt designs to secure the felt. 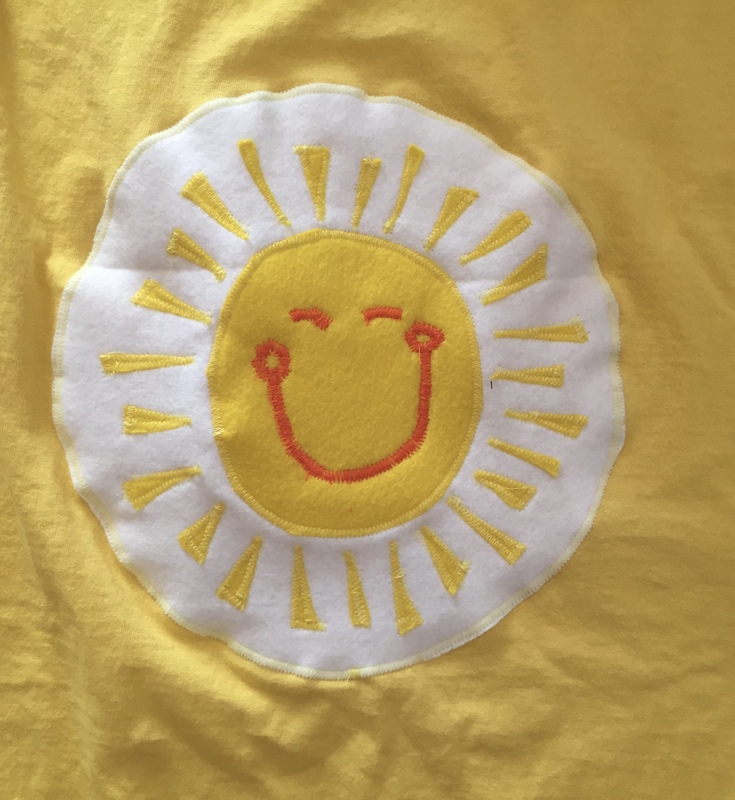 The face of the sun was also made using a zigzag stitch with a low stitch width, making the stitches close together. 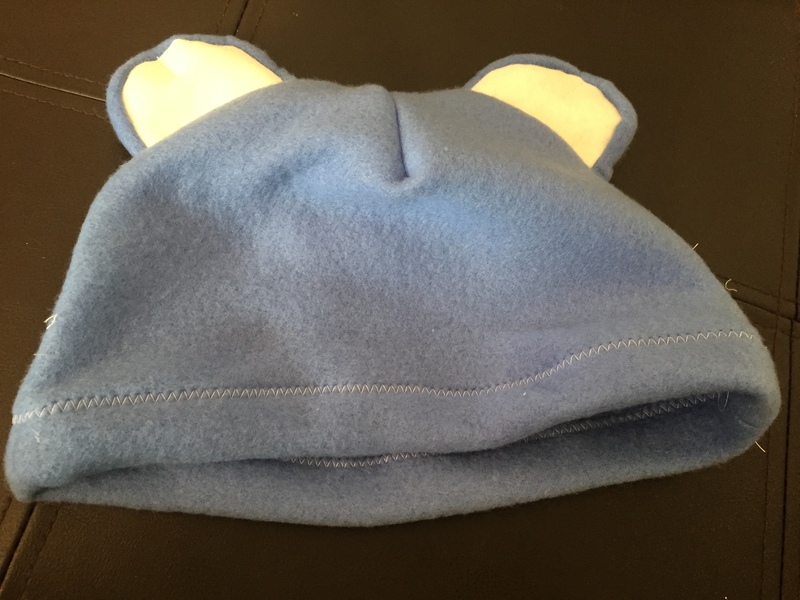 For the bear ears, I decided the best option would be fleece hats with ears sewn in. Also, they would keep our heads warm on a cool evening! 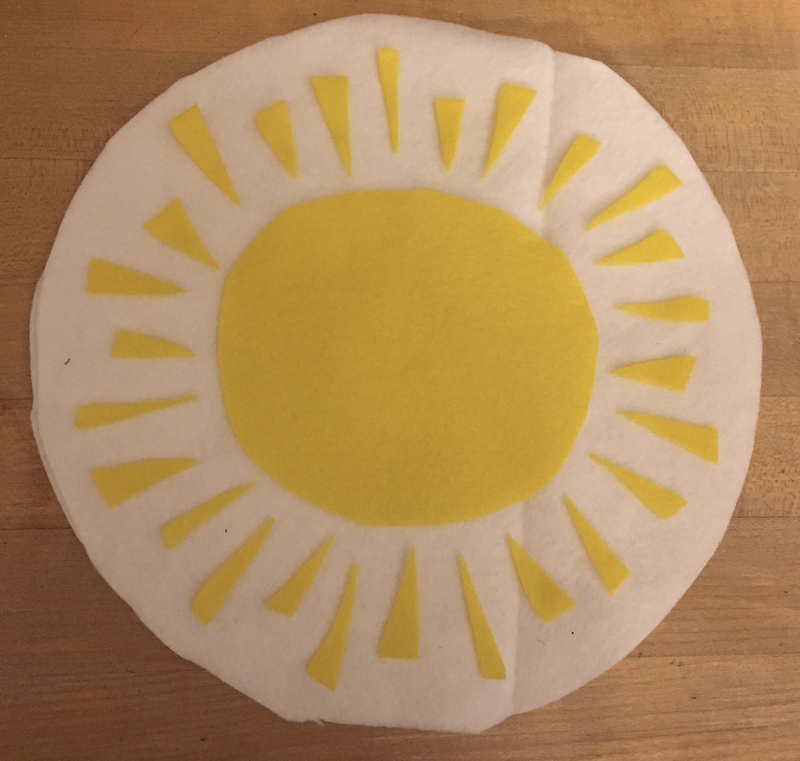 I found a kids pattern and tutorial that I used to get the basic idea of how to make them, then went about cutting out my own in coordinating yellow and light blue colors. 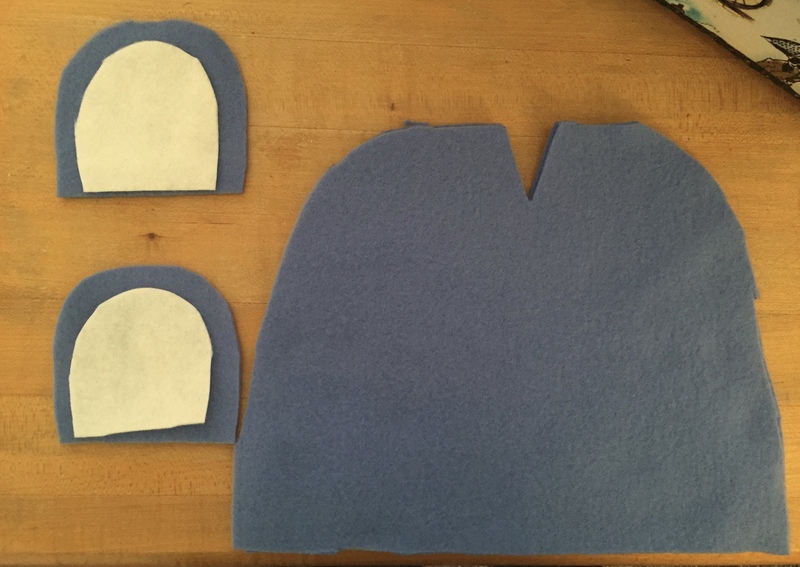 I also cut out ears for each hat and used white felt for the inside of the ear. 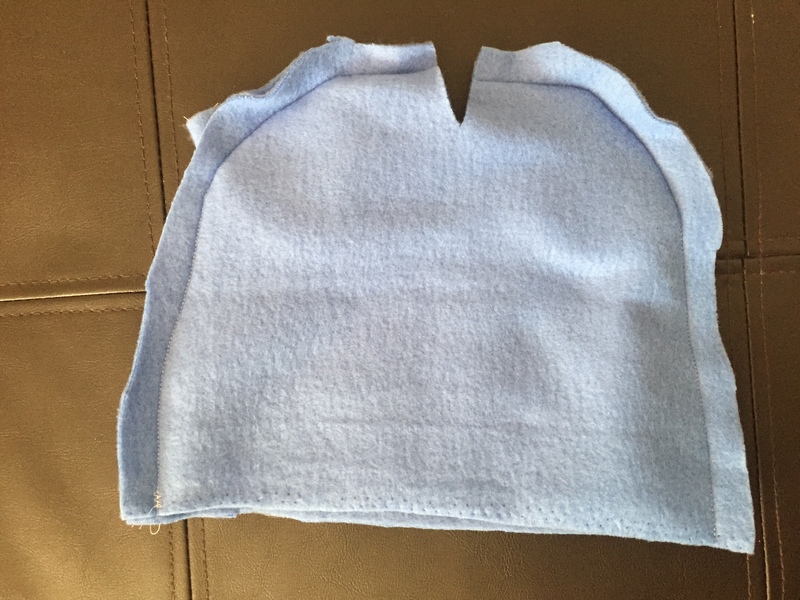 To get the sizing for the template of the hat, I used one of my husbands stocking caps. Taking into consideration that it was knit and would stretch more than the fleece, I made my hat pieces a bit larger. With the right sides together I sewed around the hat and then sewed the “V” closed. 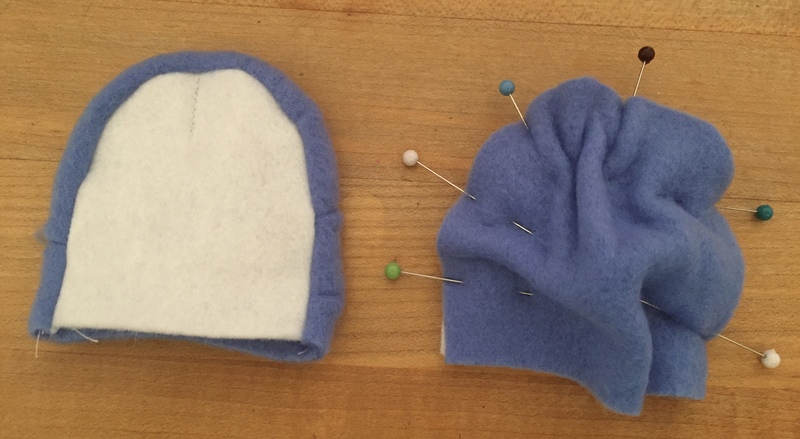 Finally, I turned the bottom of the felt under about an inch and used a zigzag stitch to tack the hem of the hat. The costumes ended up working great and while I am a little biased, I think our family of 3 (see picture below) looked pretty cute! I was hoping to save them to reuse maybe for another year… but sadly I will have to remake Grumpy Bear’s costume because my husband (innocently) tossed it in the washing machine and dryer the next morning and the felt shrunk. Word to the wise – if you plan to wash these costumes and reuse, pre-wash your felt OR hand wash/hang dry! One final comment – I wish I had made the white belly badges a little bigger… Something to consider if you are trying this on your own.